At one time, Portugal ruled the world. Its explorers discovered the Cape of Good Hope, created colonies around the Indian Ocean, reached China and Japan, founded the city of Nagasaki, and claimed much of South America. The glory days of the Portuguese empire lasted from 1415 to 1750, and left a rich heritage in Portugal. But geology was the nation’s Achilles heel. Portugal’s capital, Lisbon, midway along the Portuguese coast, is not close to a plate boundary and is not a place to expect a major earthquake. History decided differently. 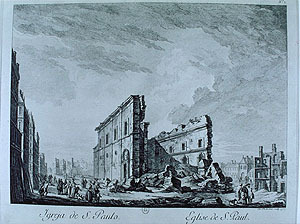 The Lisbon earthquake of 1755 is among the worst disasters to hit Europe in modern times. It devastated the Portuguese empire. Still, many articles, newspapers and even some scientific literature overstate the magnitude, number of casualties, and impact on society; scientific papers comment on the fact that some statements appear exaggerated. Let’s look at the facts. It came from the Atlantic Ocean, during the celebrations of All Saints day. In Lisbon, Sunday, 1 Nov 1755 was a sunny day, warm for the time of the year. Around 9:35am, gentle shaking started, as from heavy carts, and a rumbling sound came from the ground, lasting about 1.5 minute. A minute later, there was a sudden violent shock: strong shaking lasted 2.5 minute, causing panic. Another minute later, there was another shock, perhaps stronger than the previous one; this time the shaking lasted 3.5 minutes, slowly becoming less violent. These nine minutes left Lisbon in ruins, its population destitute from the immense destruction. 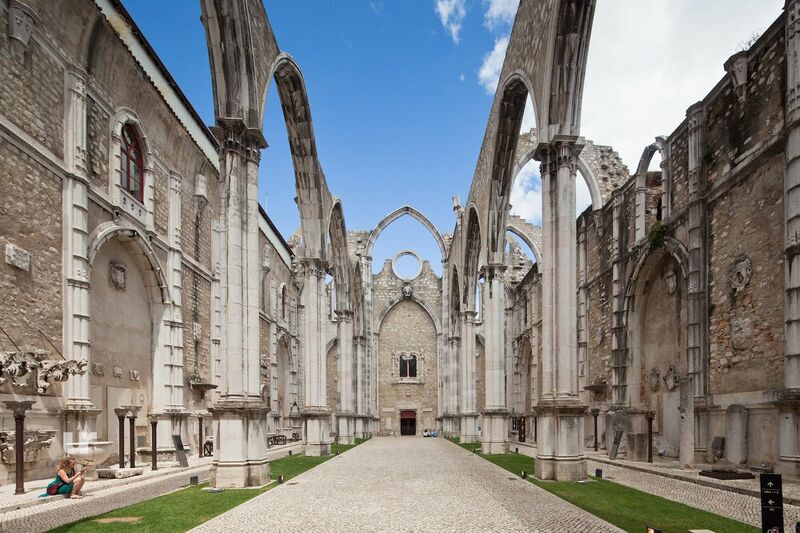 All major churches in Lisbon collapsed, killing many of the congregations. Over 80% of the houses were damaged. Deep fractures were left in the city. The first aftershock came at 11am. The aftershocks continued for months and some were themselves violent. Lisbon was not the only place that was badly affected. There was major damage in the Algarve; Faro was almost completely destroyed. Damage in southern Spain and Morocco was extensive. North of Lisbon the damage was considerably less. The shaking was felt across Spain, France and Italy, to about 2500 km away. There is a detailed and precise report on the earthquake from Cadiz, in southern Spain, 350km southeast of Lisbon. The same three phases were observed with a similar duration (perhaps the last phase lasted a bit longer), but the third phase was notably less violent than the second, whereas in Lisbon they were more comparable. The population of Lisbon fled to safety, away from buildings. Many went for the harbour. Around 10am, some 30 minutes after the quake, a mountainous wave came up the Tagus river. Within 5 minutes the water rose to a height of 5 to 6 metre; the wave penetrated 250 metres inland impacting especially the western areas of Lisbon. Many boats overturned. A large pier with many people sheltering on it sank and completely disappeared, probably due to liquefaction. The first wave was followed by 2 or 3 more, over 1-2 hours. The first major aftershock occurred in between these waves. In the midst of the destruction, there was one lucky break: the tsunami hit an hour before low tide, so that the base water level was low and the tsunami was slowed down by the outgoing tide and flow of the river. On the coast, the harbour of Setubal was swamped by the tsunami with water reaching the first floor of buildings, 6 metre high. Further south, the harbour of Lago was ruined and had to be moved afterwards due to the sediment. Here the waves came over the city walls, 11 meter high: the water traveled 2.5 km in-land. Blocks up to 4500 kg were deposited on the coast. Portimao was badly hit. Faro escaped lightly, protected by a sandbank in front of the city (but this was scant consolation as the city had been destroyed by the earthquake instead). Elsewhere in the Algarve, the highest waves reached 20 metre, perhaps higher. In Agadir, Morocco, the water also came over the city walls. There was tsunami damage on the island of Terceira on the Azores. 3.5 meter high waves reached Antigua 10 hours after the earthquake. There was damage in Recife, Brazil. In Cornwall, UK, the waves were 3 meter high. Some reported tsunami heights seem overstated. For instance, for Cadiz, in Spain, a wave height of 17-19 metre is often stated. But the town survived unscathed: as it is 11 metre above sea level, the tsunami was less than that, probably 5-10 metre. Some reports mention very high tsunamis in Morocco, but this is disputed: the wave heights may have been around 5 metres instead. In the majority of places, the reports state that the water initially came up: there are far fewer descriptions of the water initially receding. That may be related to the fact that it was already low tide, and an initial outflow may not have been noticed. Elsewhere in Europe, to the north, the earthquake triggered resonance waves (seiches) on lakes, rivers and harbours. They reached 60 cm amplitude in Loch Ness, and were observed from Switzerland to Finland including the Netherlands and Stockholm, and possibly even along the coast of Greenland. In the UK, large waves were seen along the south coast but little actual damage was reported. Computer models indicate that the region between Penzance and Lizard Point, near the tip of Cornwall, would have been worst affected; elsewhere wave heights were less than 2 meters. The extensive continental plateau around the British Isles disperses the waves and provides a degree of protection against tsunamis. But Spain and Portugal lack this protection. After the earthquake, fires broke out, some from cooking fires and candles, and some set by looters. These quickly raged out of control and large areas of downtown Lisbon but also surrounding districts burned down. Some buildings which had escaped major earthquake damage, including the Royal Palace and the Patriarchal Cathedral were instead gutted by the fires. Lisbon burned for 5 days. In medieval times, fires were a major hazard for cities as the narrow streets and inflammable building materials made them impossible to control. Once a fire started, chances were that the entire town would burn down, with many casualties. Better control of building materials later improved the situation but city-wide fires remained common. Lisbon was destroyed by earth, water, and fire, but most of the physical damage was done by fire. The death toll in Lisbon is generally given as between 30,000 and 60,000. Recent evaluations of the historical records have suggested that some 12,000 died in Lisbon, close to 10% of the population. Theses studies put the total death toll across Portugal and Spain at 15,000 – 20,000, in agreement with the 14,000 recorded fatalities in Portugal and Spain. The death toll from the tsunami is estimated at 900, of whom 600 were on the sinking pier. The recorded population in Lisbon fell by just over 31000 people, from before to two years after the quake (these records exclude young children below the age of 7). The decline includes people who moved away from the destruction and it can be considered as an upper limit to the death toll. Portugal was well governed and the records are believed to be accurate. Taking an average of the minimum and maximum numbers gives perhaps 20,000 casualties in Lisbon. The death toll away from Lisbon was likely a few thousand, noting that the badly-hit Algarve was thinly populated. This gives a total estimate of 25,000, a bit lower than commonly quoted. The number of casualties in Morocco is not well known. The coastal towns were hit but how badly is disputed. There was another, unrelated earthquake in the Southern Atlas mountains on Nov 18 or 19, which although weaker caused destruction and casualties in in-land towns such Fez, and its effects are often confused with the Nov 1 earthquake. Casualties attributed to the Lisbon earthquake may have been very limited, or have been as high as 10,000. The total death toll of the Lisbon quake is thus in the region 25,000 – 35,000. This was not the deathliest European earthquake in recent history (60,000-80,000 died in the Sicily earthquake of 1908, including 2,000 in the tsunami). But the Lisbon earthquake hit the heart of an empire. The economic cost was extreme. In Portugal, it amounted to 40% of the national GDP. This is among the worst on record. For comparison, the 2004 Indonesian earthquake and tsunami led to damages of order 7% of GDP in all affected countries apart from the Maldives. (For those of a curious nature: the direct cost in the US of the 2008 financial crisis came to 15% of GDP.) The 1755 Lisbon event was a human disaster but an economic calamity. Taxes were increased by 4% to pay for reconstruction and for safeguarding the devastated regions from pirates. Even so, the cost exceeded the capacity of the Portuguese economy. Portugal ceased to be the economic powerhouse it once was. In many ways the events of 1755 signalled the beginning of the decline of its empire. The Lisbon earthquake has some unusual aspects. These include the type of damage, and the extreme distance over which the seiches were seen. Multiple reports note how large buildings, such as castles and churches were worse affected than smaller houses. Many of these buildings, supported by arches, did not survive the shaking. Large buildings have low resonance frequencies. Earthquakes bring shaking with a range of frequencies, both high and low, but for this earthquake, the low frequencies (slow shaking) seem to have dominated. Also notable were the three different phases. The first phase showed minor shaking accompanied by a strong rumble. These were the so-called P-waves (P stands for primary), a sound wave through rock, often heard but rarely felt. P-waves travel at typical velocities of 4-6 km/s and are the first waves to arrive. The second phase would have included the S-wave (S for secondary), which travels about 40% slower. S-waves are much stronger than the P-waves. Reports from ships in the harbour mention how the city seemed to be rolling back and forth. This is typical of a third type of waves, Rayleigh waves. While P and S-waves travel through the rock, Rayleigh waves travel over the surface of the Earth. They give a rocking motion, back and forth, and up and down. Rayleigh waves have a typical period of around 20 sec, longer than S and P-waves which have periods of around 7 sec. A longer period means a lower frequency: strong Rayleigh waves could therefore explain the pattern of destruction, worse for larger buildings. Rayleigh waves fade more slowly with distance than other kind of waves: this and their low frequency can explain the seiches seen on lakes thousands of kilometres away, without requiring an excessively large earthquake. Surface waves are produced in shallow earthquakes. They come in two types, Rayleigh waves and Love waves (the latter rock sideways, a motion not reported in Lisbon). Love waves tend to be absent from oceanic earthquakes. They strengthen from reflections of the Moho separating the crust and mantle, but the Moho is much less pronounced underneath oceans. This indicates that we are looking at a shallow earthquake, somewhere in the ocean, away from the continental shelf. Houses in Lisbon streets with a south or south-west orientation appeared to have had less damage. These houses supported each other. Thus, the Rayleigh waves came in from that direction. The earthquake occurred somewhere in the deep Atlantic Ocean, south-west of Lisbon. Finally, the second and third phase of the quake, felt both in Lisbon and Cadiz, were too far apart in time to be different waves from the same event. It is likely there were in fact two earthquakes in quick succession. As the strength ratio differed in Lisbon and Cadiz, the two quakes probably did not come from the same location. The second one may have been a bit closer to Lisbon. The earthquake happened roughly south-west of Lisbon, and there is no doubt it was out at sea. If nothing else, the tsunami provides a clue! The indications for Rayleigh waves also fit this. The absence of Love waves suggest a location off the continental shelf, in the deep ocean. However, there is a lot of deep ocean in that direction. Can we get an indication for how far away it was? 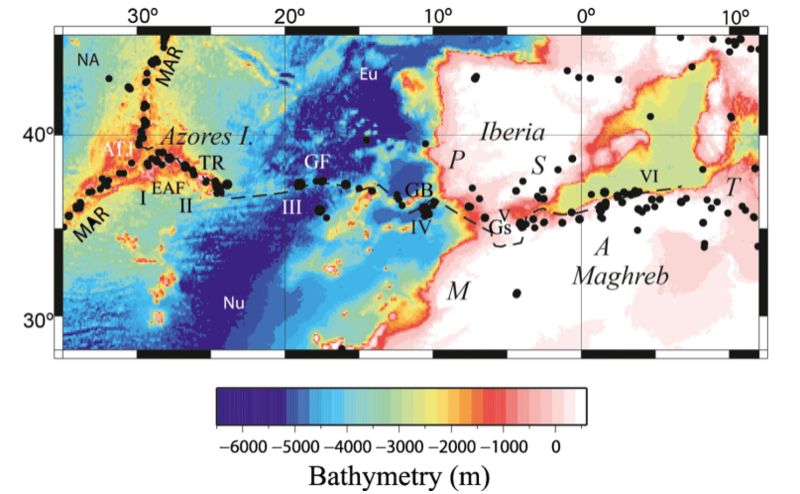 The image shows the shaking map, which shows that the worst effects were along the coastal strip, from Lisbon down around the tip of Portugal. Between Portugal and Morocco is the Sea of Cadiz. The map indicates that the epicentre would have been to west of this, closer to Portugal than to Morocco. A first indication of the distance from Lisbon comes from the time delay between the P-wave and the S-wave. Typical P-wave velocities through crustal rock are 4-6 km/s, whilst S-waves travel at 2.5-3.5 km/s. There was a 2.5 minute delay between the two: this gives a distance to the epicentre of roughly 300 kilometre. There was also a time delay between the earthquake and the tsunami, around 25 minutes for Lisbon. The tsunami travels much slower: a 25-minutes delay is roughly 300 kilometre. The image shows three proposed locations for the earthquake (it is taken from a study of tsunami risks to the UK). The distance of 300 km from Lisbon is consistent with locations A or B. Location C may be a bit too close to Lisbon although it is not excluded. If there were indeed two earthquakes, they may not have the same location and only one of the two may have caused the tsunami. The Lisbon earthquake is often stated to have been an M9. This extreme size should be taken with caution. 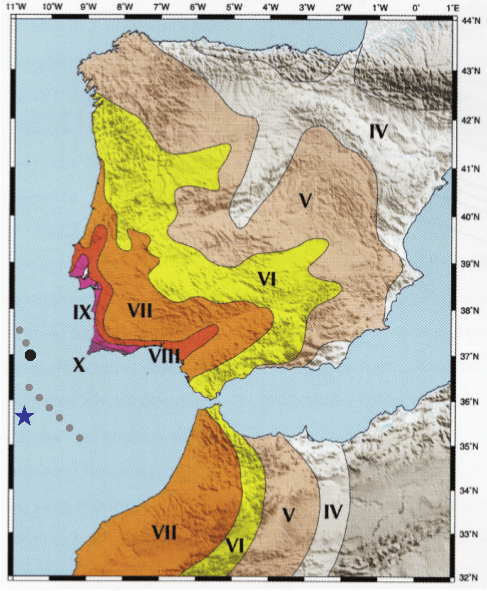 Earthquakes of this size only occur in subduction zones, and there is no such zone south-west of Lisbon (sometimes it is argued that there may be one developing, but this is based on the presumed size of the earthquake and the argument becomes circular). Calculations of the magnitude based on the damage and extent give lower values. The most recent estimate of the magnitude is 8.5+-0.3 (Martinez-Solares & Lopez Arroyo 2004). Earlier authors estimated M8.7+-0.4. Earthquake magnitude. 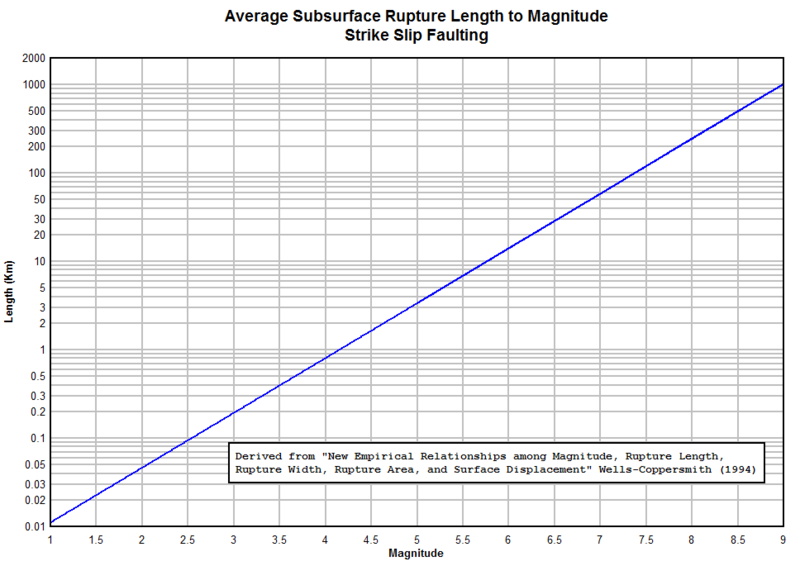 Black curve: magnitude probability based on shaking. Dashed line: number of earthquakes versus magnitude. Red curve: combined probability curve for the magnitude of the Lisbon earthquake of 1755, peaking at M8.35. Now consider that weaker earthquakes are much more common than strong ones. If you have a range of possible magnitudes (8.2-8.8, in the first case), it is more probable to be in the lower range as these occur more often. There is a trick of statistics for taking this into account. 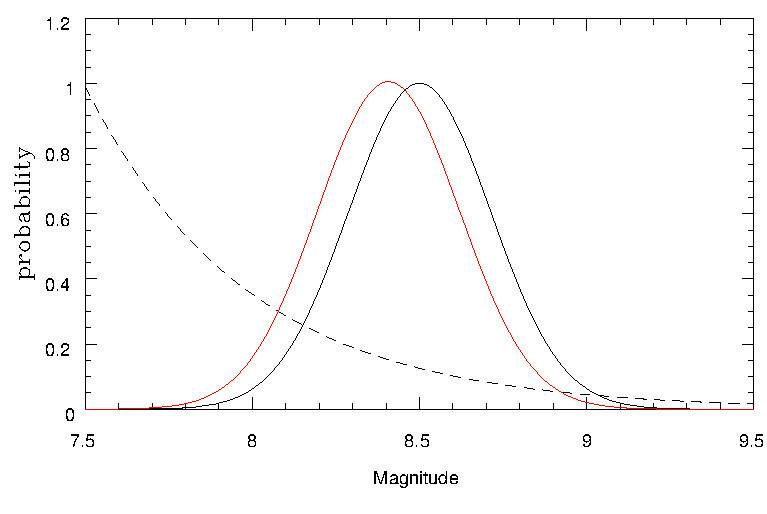 The black curve in the figure shows the published likelihood distribution for the magnitude, 8.5+-0.3, (assuming a normal distribution). The dashed line shows the probability of an earthquake of a certain magnitude. The actual probability is obtained by multiplying the two: that is the red curve. This reduces the probable magnitude to about M8.35+-0.25, say M8.4. The 1755 event was thus likely low-to-mid 8. This is just about within the range of what the off-shore area is capable off. M9 would be difficult to explain. There is little doubt that the Lisbon event is connected to the Gibraltar-Azores transform fault, separating the African and European plates. Near the Azores, in the middle of the Atlantic ocean, this fault is clear (see this excellent article for a description), but follow it towards Europe and the fault becomes diffuse: rather than a single fault line: it becomes a series of parallel, short features over a width of 200-300 kilometre. Close to the Azores it is a transform fault, with sideways motion at a snail-pace of 4mm per year. Near the continent the two plates move towards each other. There is no subduction: subduction happens if one of the plates is colder (denser) than the other, and therefore sinks. In this region, both plates have the same age, temperature and density. Like sparring politicians, neither is willing to give way. In the absence of subduction, the region becomes a crumple zone, and tries to form an oceanic mountain range. Azores-Gibraltar fault. ATJ: Azores triple junction; TR: Terceira Ridge; EAF: East Azores Fault; GF: Gloria Fault; GB: Gorringe Bank (From Bezzeghoud et al 2013). 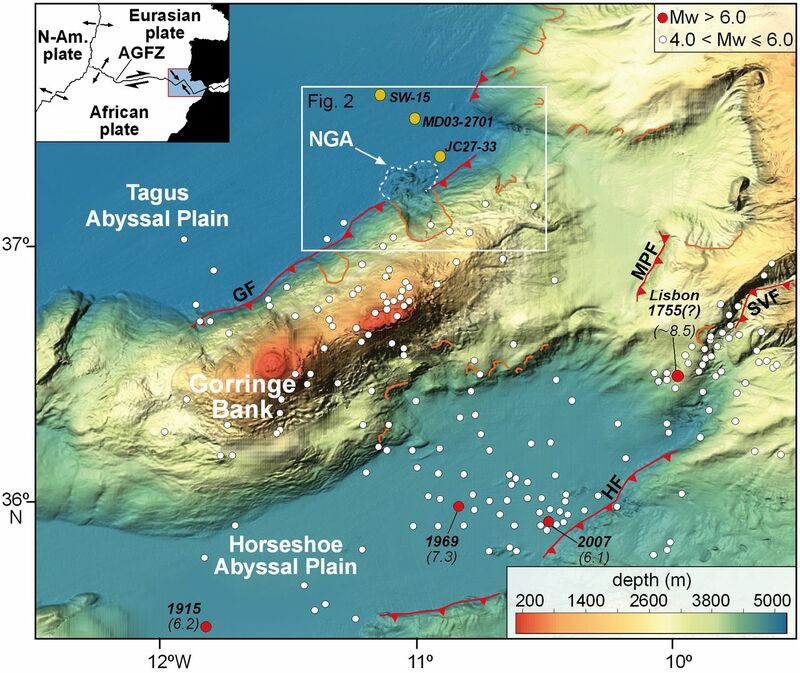 Some earthquake data suggests a new Africa-Europe plate boundary may be forming, which in the future will replace the current diffuse boundary. In such a complex region, the plate boundary can move, with bits of plate jumping back and forth between Europe and Africa, a kind of pass-the-parcel. 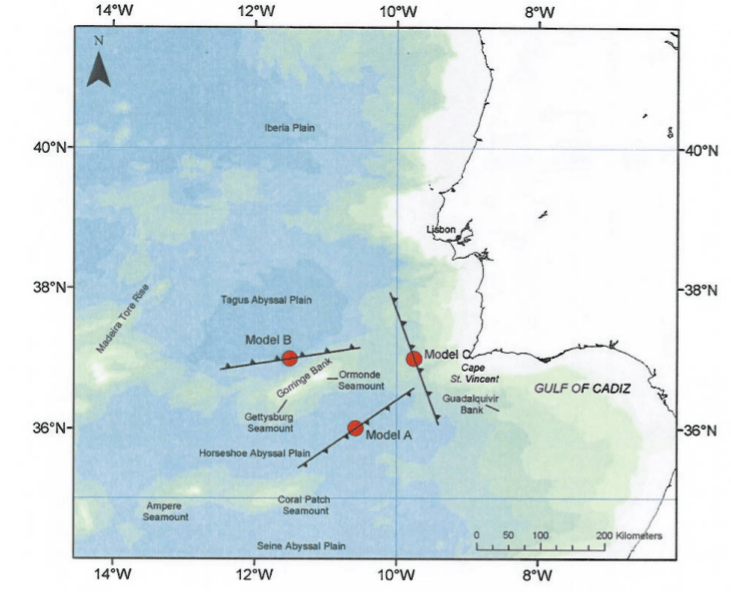 The figure above shows the location of recent earthquakes around the Azores-Gibraltar fault, and is taken from Bezzeghoud et al 2013. An earthquake-free zone is visible between 24 and 18 degrees longitude: this gap is the seismically inactive Gloria Fault (GF). East of this, from 18 to 11 degree longitude, the Gloria Fault enters a complex region which has relatively frequent major earthquakes, include an M8.4 in 1941, M7.8 in 1969 and M7.0 in 1975. Around the Gorringe Bank (GB), the fault becomes indistinct and deformation is spread out over a width of 300 kilometre: this is the diffuse region. While elsewhere along the fault the earthquakes are shallow, in this region they extend to 150 km depth. The Gorringe Bank (sometimes called the Gorringe Ridge; it is named after the discovery in 1875 by Captain Henry Gorringe) may be a crucial part of the story. Whereas elsewhere the two plates slide along each other, with varying degrees of violence, here the earthquakes indicate a head-on collision. In the absence of subduction, there has been as much as 50 kilometres of crustal shortening and folding. An underwater mountain chain has formed; two of the seamounts, Gettysburg and Ormonde, reach to less than 100 metres below the sea surface. (During the ice age parts of it would have been near the sea surface, and perhaps wave erosion have affected the peaks.) To the north is the Tagus abyssal plain, 5100 meter deep, and to the south is the Horsehoe abyssal plain, only slightly shallower. The latter is where the Gloria Fault would run had it been well defined, and is the location of most of the large earthquakes. Remove the sea, and the Gorringe Bank would be the second highest mountain chain in Europe, higher than the Alps! At the northern edge of the Gorringe Bank runs the Gorringe Fault. Early reconstructions assumed that the Lisbon earthquake occurred in the Horsehoe plain, where the 1979 earthquake was located. But the timings of the tsunami do not quite fit, and they favour a location a bit north. That would place it in or near the Gorringe Bank. But this is also problematic as the Gorringe Bank appears inactive. A third possibility is the MPF (Marques de Pombalt Fault), but this seems too small for such a major quake. It has been suggested that the MPF extends further north, perhaps connected to the Lower Tagus Valley fault (underlying Lisbon), and that the region in between snapped. Finally, a horizontal fault plane has been suggested underlying the region. The strongest argument for this is based on a lack of evidence against it! It is perhaps a bit worrying that 260 years after one of the strongest and most destructive earthquakes in modern Europe, the fault which caused it has gone in hiding. 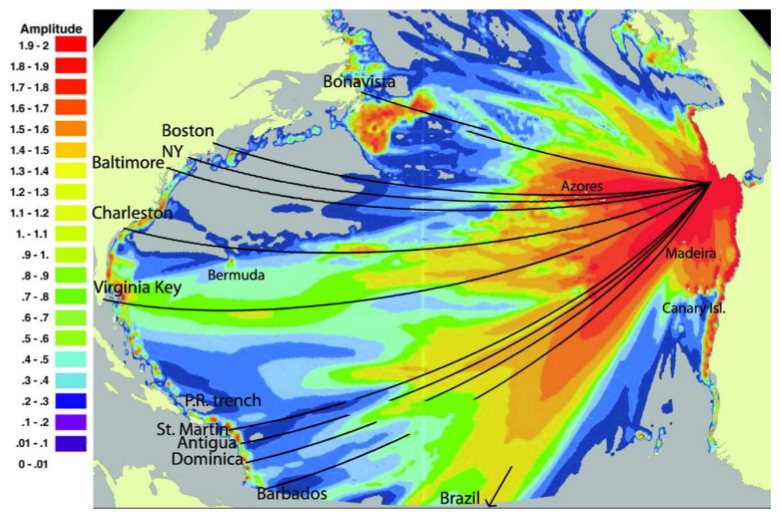 Part of the solution may come from the study of the tsunami wave heights in the Americas. These are quite dependent on the location and orientation of the fault. Detailed modeling has shown that it is not easy to get strong tsunamis in the Caribbean from Spain. The only model that predicted this is one with a NE-SW fault within the Horsehoe plain. None of the quake models mentioned above have this! An ancient transform fault may have existed here dating from the opening of the Atlantic, but there is no reason to assume that such a 100-million-year old fault remains active. Ancient faults, like old-age pensioners, should enjoy the modern world, not try to reshape it! The longest fault in the region is the Horsehoe fault, at 120 km length. Other faults are no more than 100 km long. The largest earthquake that can be expected from the Horsehoe fault is M8-8.3. This fits our estimated magnitude of the Lisbon earthquake of 8.4+-0.3. Larger quakes are difficult to get within this fault system, unless several faults rupture simultaneously. The fact that Lisbon experienced two separate jolts is often ignored. This may not have been a single quake, but two in quick succession. There may be more than one smoking gun on the sea floor. A fault ruptures at about 2 km/s, about the same as the speed of the S wave. If the fault was pointing towards Lisbon, the total duration of the earthquake is the time of rupture, plus the difference in travel time between one side and the other. That gives a rupture length of 60-120 kilometres, in good agreement with the known lengths of faults in the region. Do remember that you would need two. The Iberian peninsula, encompassing Spain and Portugal, has been a semi-independent plate. 40 million years ago it was attached to Africa, south of a spreading ridge, now extinct, in the Bay of Biscay. Later Iberia separated from Africa, rotated 35 degrees counter-clockwise, and attached itself to Europe. This plate-jumping was part of the closing of the Tethys Ocean and formed both the Mediterranean and the Pyrenees. The fault line separating Africa from Europe jumped south to accommodate the changing allegiance of Iberia. This jump, and Iberia’s rotation, may have left fractures behind. 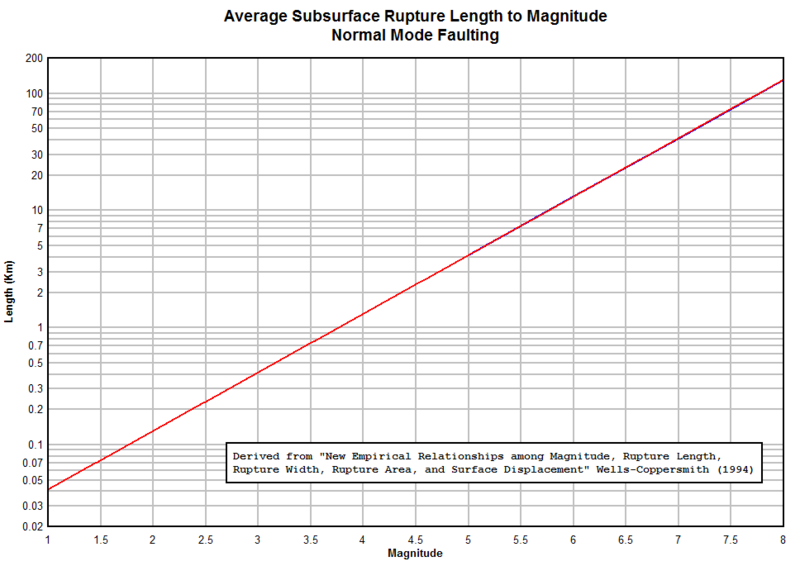 Recurrence times for intraplate quakes are long. For the 1755 quake, the recurrence time has been estimated as between 1000 and 10,000 years. Older coastal tsunami deposits have been found along the Algarve, similar to those left by the 1755 tsunami, approximately dated to 2400BC and 6000BC. This gives a recurrence time of perhaps 4000-5000 years. Smaller tsunamis are more common in the region, however. Under-water studies have found turbidite (deep sea mud-flow) deposits, as could have been generated by large earthquakes. Both the 1969 and the 1755 event have left well-dated turbidites. Earlier ones have been dated to 218 BC, 3010–3960 BC and 7765–8065 BC. Turbidites indicate a recurrence time of 1800 yr, but not all of these will have generated major tsunamis. There is evidence for a large landslide on the northern edge of the Gorringe Bank. It left a scar 2 kilometer deep, leaving a hole of 30km3, and has been carbon-dated to 30,000 years ago. It is not known whether this caused a tsunami but it could have caused destruction across the Atlantic. This was not the first devastating earthquake to hit Lisbon. The Tagus river follows a fault line, and large earthquakes can and do occur along it. In 1531, the city was hit hard, when an earthquake along this fault struck the centre of Portugal, east-northeast of Lisbon, with an estimated magnitude of M7. The main shock occurred on 26 Jan, early in the morning; there had been two precursor shocks earlier that month. A third of the city was destroyed, and the shaking caused flooding in the Lisbon estuary, possibly due to a landslide in the river. Some reports suggest that the housing stock may have been worse affected than in the 1755 event. If correct, apart from a lesser quality of the houses, it may also mean more intense high frequency vibrations. There was also a severe earthquake in 1321, again with widespread destruction, and other significant quakes occurred in 1147 (also leaving the city, just captured from the Moors, in ruins), 1334 (destroying the cathedral roof) and 1356. 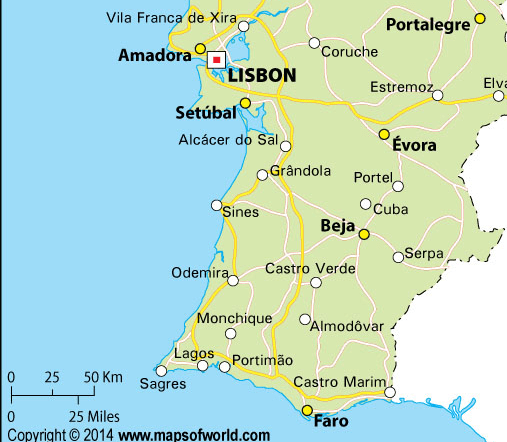 In 1909, a quake hit north-east of Lisbon, with a magnitude of 6.5. Since 1909, the region has been seismically calm. There have been many discussions of the chances of a re-occurrence of the 1755 event. But such an event may only occur once every 5000 years or so, leaving the next one a long way off. A more immediate danger is a potential repeat of those medieval quakes. Lisbon is a beautiful city built in a dangerous place. The great historical 1755 earthquake. Effects and damage in Spain. J. Martinez Solares, A. Lopez Arroyo, Journal of Seismology 8: 275–294, 2004. Fantastic article! The Lisbon event is what first peaked my interest in geology. Absolutely love the write-up! What a wonderfully absorbing article! Thank you! the felt reports from central Germany suggest an earthquake approaching M9 to me to be quite honest. M8.5+/- 0.3 works for me. I also think there were two very large earthquakes, back-to-back, on multiple faults, judging from the reports from Lisbon. The reports from as far as Germany are limited to reports of swinging chandeliers. These are likely to have been Rayleigh waves, caused more by the shallowness of the quake rather than strength. Actual felt shaking is limited to less distant areas. The highest magnitude (up to 9.4) were suggested by Abe (1974) based on the distant tsunamis. That work has been superseded and newer work does not require such extreme magnitudes. M9 is still found in tourist brochures, though. The 1761 earthquake is thought to have been accelerated by the 1755 event, not an aftershock as such but related. Very little has been published on it. The Feb 1756 earthquake near Cologne is less likely to be related: this region has fairly regular earthquakes anyway, although admittedly this one was very strong (I personally was woken up by the second most powerful shock from this region, which happened in 1992). There was a strong foreshock in Dec 1755. The faults in this region are not connected to and very distant from Iberia, so I’ll put this down to coincidence! Are the faults of the Lower Rhine Rift capable of producing earthquakes with magnitude 6 to 9 on the Richter Scale? If that’s true, our country Germany, Belgium and the Netherlands are at risk! They are capable of M6. The Basel earthquake of 1356 is estimated as M6.5 and that is about the maximum. The Aachen/Dortmund region could also go a bit over M6. To get M7, you need to go south of the Alps. Note: I’d go with Albert’s take on this. All I can provide are rudimentary rules of thumb. The actual capability of a fault to generate a specific range of quake strength, has a lot more involved than a simple equation. However, as a “rule of thumb” the length of the potential fault face can give you an idea of how large a quake it it can make. This does not take into account collateral faults becoming involved in the rupture. Just had two equally large quakes at Bardy. First one a confirmed 3.2 and the second one looks like it might be about the same. One northern rim and one southern? Thanks for very interesting post. I was in Lisbon last year. Yes, beautiful city!! 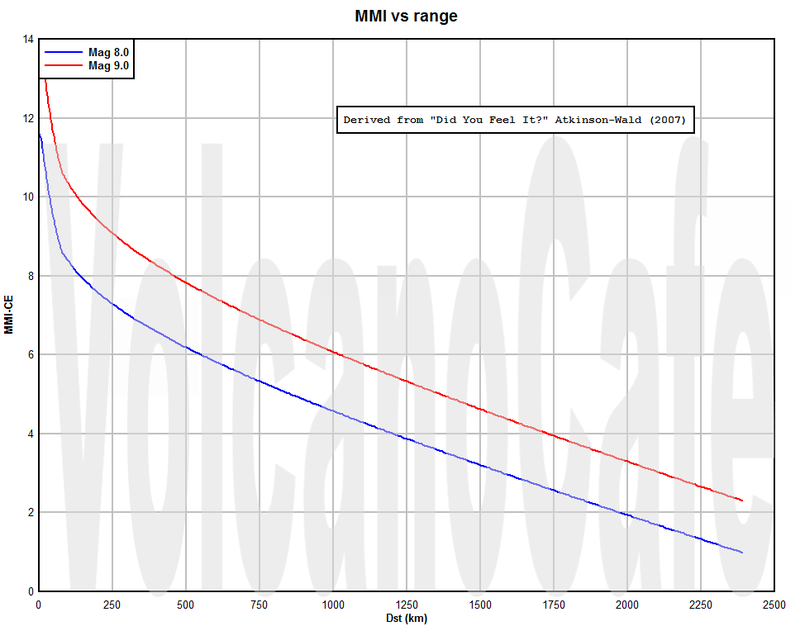 And for you guys that are ruminating shaking effects over distance, a plot of the MMI intensity vs distance for a Mag 8.0 and a Mag 9.0 quake using the non western US formulas from Atkinson-Wald. At MMI-XII, stuff is pretty much flying up into the air. I don’t know if there is an actual MMI-XIV (14), the scale always stops around IIX for every listing I’ve seen. The 14 on the plot is what the model spit out. Seeing as it is a model, it is not uncommon for a model to go off the rails when it tries to do stuff outside the range over which it was constructed. That’s just how models are. Outside the design range, they tend to revert to the behavior of the underlying curve. Polynomial based models are notorious for this. If you look at the formula, you will notice that it is in this breed. If this gives any of you heartburn, I recommend that you refer to the paper. BTW, there is a whole table in the paper for the various “c” constants to mold the model to Western US vs non Western US behavior. Why is the western US different? Because of the widespread faulting in the area. The faults tend to disperse the energy from the quakes faster than the relatively solid crust outside that region. I see Hekla is reminding us she’s still here this fine morning. No changes on boreholes yet so perhaps it’s not quite time to get the popcorn ready. Interesting drum plot around 19:40 last night, looks a bit gurgly to me … ? The “gurgle” resembles what a more distant quake looks like on the drums. If you check the timing again you will find that 19:40 is more like 19:50, so the gurgle is just how the Bárdarbunga quakes look like at that distance. Thanks, Tomas. I was wondering if that’s what it was. Great article. I learned a lot. There were so many things I didn’t know about this major event. The Guardian on St, Helens. Not that bad, and a quote from Erik Klementi. Wow. A pretty sane article! Thanks! 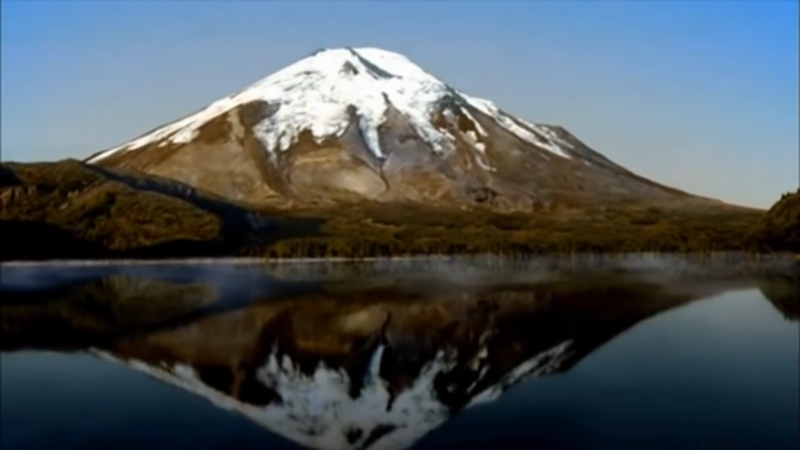 It even had a link to a decent vid of this ex pretty mountain. Now it’s a fairly stupendous crater. We have been seeing deep quakes at Askja for a little while now in 2016, but this is probably one of the strongest deep quakes we’ve seen here so far. Yes, and at Dreki, too, though in a different place from the last “string of pearls” quake. So I realize that much (if not most) of Iceland’s geological history prior to the Holocene is extremely blurry, but I figure I may as well ask this anyway. We know that there are large rift eruptions in Iceland, along with other types of large effusive eruptions. We also know that basically all the land in Iceland was formed specifically from volcanism at one point or another. Similarly, we know as a LIP, Iceland has a lot of traits similar to other flood basalt provinces, including trap formations from millions of years of volcanism. But one trait you see at other flood basalt provinces are singular lava flows of an absolutely silly size. The Pomona flow at the Colombia river basalt group traveled over 500 km from its source as an example of this ridiculous size. My question is this – in the deeper past, have there been any lava flows in Iceland that more closely resembled the size of these insanely large lava flows seen in flood basalt provinces? Given, I realize this is tough to say since the history of iceland volcanism is like peeling back an onion, likely with millions of years of history we do not know about, but I figured it would be worth asking anyway. Not in Iceland, I think. LIPs are huge events but rather short-lived, Iceland may come close in total size but this was erupted over 20 milion years. There was flood basalt event here just before the Atlantic opened, 60 million years ago: much of this in now in East Greenland. The difference seems to be not the amount of magma produced, but how much makes it to the surface. In Iceland, over 90% of the magma coming up stays well below ground, and fills the gap where the plates rift apart. In the LIPs, the amounts that reach the surface are staggering. I have the impression that the LIPs do not occur in mid-oceanic rifts but tend to be in or near continents. Perhaps the next one will be in the Lake Baikal area. Thanks for the great response. I suppose that makes a lot of sense, especially with regard to the mid ocean ridge part of the equation here. Again, thanks for the Lisbon post! It is interesting to read about the effects from this quake on culture, beliefs and religion! The quake struck in a time when influential goups in the european populations (that had grown wealthy on the first industrial development and trade and not as inherited priviledges), started to question and oppose the ruling dogma, that the powers and priviledges of royals and the hierarchy under them was given to them directly by God. The emergence and development of modern scientific ways of thinking, building models and draw conclusions gave them arguments against the ruling church and priviledged groups. In the middle of this” The enlightment process” came the Lisbon quake on the day of a religious important congregation. Most churches were filled to the limits when the quake struck and the roofs collapsed on them! Many of the poor or less religous people could not make it to the churches that day and survived because they lived in small primitive buildings. The fact that the sinful, very large red districts of Lisbon was left unharmed whereas the churches with scores of religious believers were lost, was used as a major argument in the debate on God, belief and the role of religion/ church in the society. The Lisbon earthquake thus shaked, not only the ground under Lisbon but also the foundations of western civilization. It also triggered huge tsunami waves of discussions that swept over the western world for decades after, and probably speeded up the development of our societies! You are expressing it very well. The quake had a role, or at the very least was used as an argument, in a debate on the role of religion. Many of the aspects you mention are of course much older in their origin, and the oft-stated argument that the Lisbon earthquake started atheism (which you carefully avoid) seemed an extreme overstatement to me. But it shook the catholic world badly. The conflict between the elite ruling by right versus the trading classes goes back to the 13th century, between the ‘burghers’ and the kings/dukes. It never extended to the poor. Even in the middle ages, ruling was rarely justified as a ‘god given’ right. Spain possibly came closest to this (the reconquista may be an origin of this). Atheism was already well established by 1750, at least in intellectual circles (the French revolution, showing that atheism could be as blood thirsty as any religion, was not far off). I think that the Lisbon quake had no significant effect on these developments, apart from removing a staunchly catholic power from the equation. I came to the conclusion that the economic impact was the more important. A similar event of disputed origin (some say tsunami, some say storm surge) definitely had an impact on belief systems in the UK in 1606…or 1607. The date isn’t altogether clear as we were in the process of changing from one calendar to another at the time. This event , centred as it was in the Bristol Channel is of great interest to me, as the bathymetry of this well known tidal bore estuary will almost certainly have amplified the effect. Personally I lean towards the belief that it was a storm surge coinciding with a large tide, rather than an earthquake based tsunami. Even though that means I disagree with Simon Haslett. I believe you are correct in this. The 1607 flood seems more likely a storm surge. It happened on Jan 30, 1607 according to our calendar. In England at that time, the new year started only with spring, in March, so January was still counted as the previous year, which is why is sometimes listed as the 1606 flood. Which interestingly goes a long way also to explaining why the last four months have roots meaning 7, 8, 9, and 10 — not 9, 10, 11, and 12. I think some reasons for the Lisbon earthquake to make such a big impact on religion, beliefs and society was that there was larger groups of fairly well educated people around than before, and news and information was spread to many more and at a much higher speed than before. It is also interesting that the both the Lisbon earthquake and the Icelandic Lakagigar eruption are claimed to have contributed to the French revolution. Obviously Volcan, Tellus and Pluto were involved! In oriental societies, something like this would be akin to loosing the “mandate of heaven.” At the time, the population was still heavily Gothic in it’s mentality. Dunno if “mandate of heaven” was of much concern to them. They had perceived Rome as giving them a raw deal or busting a deal and had taken great umbrage with that. Around 410 AD Alaric I gave them a little “payback.” Eventually, the Visigoths settled in the Iberian peninsula. It’s quite reasonable that major natural events would have been attributed to “god’s anger” when there was no understanding of the science. When my city (Chch/NZ) was devastated, out they came, it was punishment for some transgression, it was predicted and warned about – they’ll always find something which appears prophetic – when you retrospectively search for what a nearly infinite number of monkeys typed.. Stone and unreinforced masonry European styled churches really copped it. Lucky it didn’t happen on a Sunday. Unfortunately the media doesn’t play their part very responsibly in some cases, they’ll publish a completely wacky story in depth but when it comes to publishing expert comment, they’ll sometimes abbreviate / condense what’s been said into “plain language” – but the reporters doing this often have poor understanding resulting in omissions and misquotes, or publish something said – which was extremely technical – verbatim, leading to conclusions of “see – they don’t know what’s happening either”. Mostly to do with probability, modelling, and “prediction”. “Don’t dispute my prediction, I was right about the quake on abc day, and look – the experts don’t know what’s happening but they’re making predictions themselves – and they have a conspiracy to silence me”. Even when you’ve felt plenty of smaller quakes before, and do know what’s happening (within limits of what a layperson could be expected to know), and dismiss all that nonsense, a good strong quake rather upsets your acquired lifelong understanding of what solid ground is – or should – be. Two years of continuous and often severe aftershocks add to that misery. It must have been a frightening experience. When researching the Shackleton post, I was wondering what it would have been like to camp for many months on melting ice, eventually feeling the swell of the open ocean underneath your feet. It is always possible after the fact to find someone who had predicted it. Science does not work like that: you need to make the prediction public before anything has happened, so that your theory can be judged on its predictions. Digging out a prediction afterwards does not carry the same weight. General predictions such as ‘New Zealand North Island is at risk of a major earthquake’ are more scientific: we know this region is overdue, but that doesn’t mean we can put a date on the event, nor can we be sure it will happen. To understand science you need to understand chance: science studies how the dice are loaded, but doesn’t predict the outcome of a single roll. Whether this should be attributed to an angry god playing retribution is something that differs between religions and belief systems. Judaism went through a variety of interpretations, but the Jewish canon moved away from seeing disasters as punishment, as early as a few hundred years BC. Christianity also has a range of views on the issue, but it of course was was centred on a picture of a suffering god, somewhat incompatible with presenting disasters as punishment by the same god. Newspapers simplify not just the scientific response, but also the philosophical views. Their readership wants simple yes/no answers, not a balance of uncertainties. I’m strange. I prefer the balance of uncertainties. Here, I know how often nasty storms come and if push comes to shove, I can muddle through the catastrophe. The people are relatively well behaved and are not prone to decending into chaos. California, not so much. I suspect that WordPress and my phone had an argument and my phone lost. I had completely forgotten about this sport. As far as I know, no horses were injured. Cowboys, not so much. Equine or Bovine, you are not a real cowboy..
And the interesting bit is that Bos primigenius, or Auroch, is the direct ancestor to all modern cattle. These massive cattle could get up into the 1,500 kg range during the Pleistocene. That’s the size of a modern Limousin. Neanderthals and the more gracile “modern” humans hunted these for food. Neanderthals tended to get up close and personal during the kill, and exhibit the same sort of injury patterns as Rodeo Cowboys. In one paper that I’ve read, the greater skill as snagging smaller prey was touted as an advantage that gave Sapiens the survival edge when larger fauna became scarce. Extend that line of thought a bit, tying a knot requires being adept at abstract thought. You have to envision how the knot works so that you can tie it properly. I think this went hand in hand with language skills. Not that Neanderthal weren’t capable of it, just that Sapiens was a little bit better at it. To snare small game, rigging an effective trap saves you a lot of time in not having to chase something down with a stick or a rock. Interesting new information suggets that modern humans used genetic warfare. Human-neanderthal male crosses were infertile (probably denisovan too) so breeeding themselves out. In this situation you just need a breeding majority to take over genetically. What I particularly find interesting, is that there is an obvious tactic involved in these races. Two large guys to try and subdue the horse, and a wirery spider monkey like guy to put the saddle on and try to ride. The largest of the large guys serves the same purpose as the anchor position in tug-of-war. The one guy in the green shirt who goes on the one man slide ride obviously wasn’t much of a load and was unable to serve as much of an anchor. The horse didn’t seem to have much trouble dragging him around the lot. I hadn’t seen that: thanks. Obviously, air pressure must have been no more than 80% of current levels because O2 was lacking. Now they say that half of the nitrogen was missing as well, with air pressure 3.56 billion years ago of 0.23+-0.23 atm. This team has made similar claims before. (They also have assumed ocean temperatures of 70C in their previous work which would be above the boiling temperate at that pressure, so some reconciliation will be needed.) It will be controversial: an independent team should repeat their work. I know of one study putting a lower limit of 0.5atm on the nitrogen pressure at that time which is only barely consistent with this result. Great article, thanks Albert, the description of p, s and Rayleigh waves finally made sense to my non-mathematician brain. I could link it to the mag 5 UK quake I felt in 2008 which was 14km (9 miles) deep and I heard it roaring closer through the shale hills, felt the house shake to and fro like a jelly and heard the roar going on its way westwards as the sound faded away. We were 100 miles from the epicentre. Lughduniense’s map of Spain’s geology is interesting in that the worst affected areas were in the depressiones tercaniarias, which may have been rock formations more prone to liquefaction. I remember that one, around the mid east of England. We didn’t feel in Surrey, but our cat did. At 1:06am he jumped out of my arms, went down and growled like a dog. Then did it again a few seconds later. But there was no movement at all. It was only the next morning I heard the news and realised what had spooked him. I thought that quake was something like 3.6 but I just checked it, and you’re right. How cool (and scary) to hear the sound like that! Our cat must have heard and maybe felt the Rayleigh passing through. I don’t doubt it. I have a Pekinese that goes batshit crazy during thunderstorms. I have seen his temperament change when there is a line of thunderstorms 200 miles out. That I guess is atmospheric waves, very low frequency pressure waves which travel out from storms. They could be a reason why children get restless ahead of storm. Our ears are very sensitive to pressure fluctuations. Human bodies are not as well designed to pick up ground vibrations. Would someone who has the knowledge care to comment on the significance of these waveforms? The one thing I notice is the first main peak goes upwards in the quakes during the eruption and downwards in the more recent quakes?? Isn’t the initial peak polarity at different stations what is used to plot beach balls? This would indicate that the latest quakes have reversed polarity beach balls, and the activity is due to repressurization rather than continued collapse. Carl? BTW, where did you find the waveforms? “First Motions” determine the beachballs. The problem is that after first motions have occurred, reflection and refraction come into play and really mess up the clarity of the signal. Yes, this means that the motion is in the opposite direction in the current set of earthquakes, or at least that we are in the opposite lobe (assuming it is in the S wave). This can be interpreted as upward rather than downward motion, but it may also be a fault with a different incline (inwards versus outward dipping, or verticla versus horizontal)) or orientation. Another eruption in the South Sandwich Islands. As usual over there, only visible to satellite. Yogi bear and Boo-boo are excellent guides, it might cost you a pickinet basket or two. He’s smarter than the average bear. Lol – how do we get past Ranger? Unless you want in depth discussion on each geologic feature just look it up, make reservations if need be and go for it. You are already late for this July. In 2013 I made my reservations for August in December the year before and March the year of. We stayed in hotels and lodges and did not trek so you may have more time. Good luck and you will have fun as long as you get there. Be prepared for any thing snow, rain Grizzly Bears, Bison. prone to Monsoonal rains from the southwest. From my days as an Aerial Firefighter and visitor- though I never did an extended trek…. Yellowstone it has an unusual name. But I do not know if he or his kid are still in business. I will let you know if they are..
That’s a kind offer, thank you. Being British I can handle rain but not guns so need a friendly American to hold my hand! Alert level at Ruapehu raised to yellow due to increased gas output. I dropped in here to post the same thing – you beat me to it. There’s a small but clearly visible change in the SSAM chart, starting about 3 May. The drums show less tremor than a week ago – I’m guessing it’s also very windy and cloudy there today and for the next few days through the weekend – so conditions for more flyover views might not be good. One of the drums this morning. Ignore the larger quakes, the blob at – 12 hours was a M4.7 in Christchurch, at -7 hours a M5.2 in Bay of Plenty, the last two a M4.7 then a M5.2 in the Wairarapa region. They don’t call this place the “Shaky Isles” for nothing. The epicentre of the M4.7 in Christchurch was ~3km from my house, 7km deep. Made me jump, even though I’m very used to it. The apparent increase in background activity from about 14 hours ago may be partly wind, but it’s now looking like a return to volcanic tremor as was seen a week ago. Something is up at Ruapehu. I’m in touch with the correspondent who was at the volcano – will try to keep an eye on this one. There is something going on at Bárdarbunga, but it is as of yet to early to say what that may be. Whatever it may be, it is not as of yet onset of an eruption, but definite unrest that may or not may lead to an eruption. 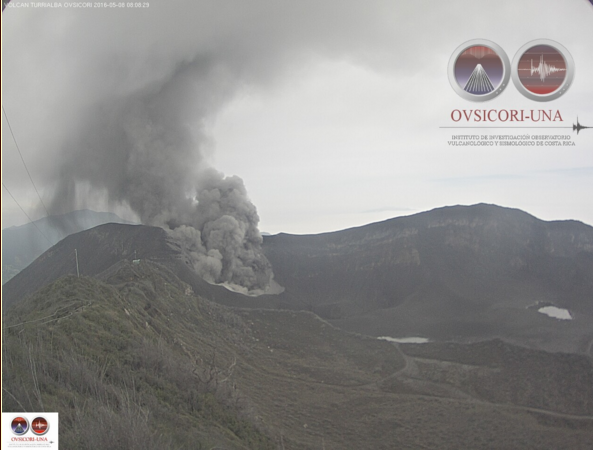 The central volcano is currently experiencing heightened activity with seismic unrest that may indicating that the system is nearing an eruption in the region inside the caldera or at the ring fault of the outer edge of the caldera. Note that the activity may very well die down, but currently it is worthy of notice. Also, if there would be an eruption it would most likely be small. And with small I mean around the size of the 1996 eruption. It is not likely that an eruption column would become higher than 5km and the eruption would most likely be brief. This is not an eruption warning, those are handed out by the Icelandic authorities. This is just a friendly heads up from an idle geophysicist. Wait for the official Stonetablet from Iceland. None below 1.5 are at all accurate. The bigger the better is the rule. I think it is over for now, but I am not ruling out a bit of ruccus from Bárdarbunga in the next few months. The reason I suspect it is that the earthquakes has lately changed from tectonic to VT.
Couldn’t a small eruption under ice turn into something more explosive due to a water/magma interaction? Forgive me if this has been written up before, but does Bardarbunga have a particular pattern leading up to eruption? Does it, for example, go for the Hekla style , with little or no warning? We have only witnessed one Bárdarbunga eruption. And that one was small and with very short duration. It is not believed that Bárdarbunga normally does big eruptions from the caldera. And we should also remember that the volcano has not had time to build up a lot of pressure. So, my guesstimate is that it will last from a few hours to a few days and is most likely to be a VEI-2 that barely breaches the ice, or at most a small VEI-3. It will most likely not be another Grimsvötn 2011 and definitely not a Hekla style eruption. I think that we will be seeing more of this type of intrusive swarms over the next few days to months and then a small eruption, or it may return back to tectonic earthquakes as the “plug” settles further. Over 90 percent of the caldera eruptions has been VEI-1 to VEI-2 with just a tiny sprinkle of VEI-3s. The big ones are effusive with phreatomagmatic detonations out on the Vatnaöldur or Veidivötn fissure swarms. People always forget that Grimsvötn is an order of magnitude more explosive compared to Bárdarbunga. Most likely due to alternating magma reservoirs and readily available water. Would VEI1 be enough to get through the ice? Or would it just form more cauldrons? Since VEI-numbers are calculated upon what goes through the ice it certainly would. If it does not go through the ice it gives no measurable ash column or tephra volume it would rate as a VEI-0 automatically. It was unlikely to be a storm surge as the water receeded prior to the giant wave comign crushing on land. Also the morning was said to be sunny and the ships were planning to go to the sea. However, meteotsunami events (phenomena little understood) have occurred probably in 1858, 1929 and recently in July 2011. At least a M5.8 event happened in Calais strait in 1580 and triggered a submarine slide and a minor tsunami that flooded inland. So the 1607 event could have been caused by a nearby earthquake too. A report of a small tremor heard that morning could corroborate the earthquake hypothesis. Circa 6100 BC a major submarine landslide in Norway triggered a much larger tsunami. Storm surge happened in 1953 but this was a well-known event; as the storm was experienced too. I find the meteotsunami possibility quite intriguing. This is a reply to Neil Law and Albert, but incorrectly placed. I think there have been far more of these on British shores than many realise. Quite a few know of the large tsunami that struck Northern Britain a few thousand years BC,but how many know about this one? That’s weird: all the eyewitness reports fail to mention that the sea receded – or didn’t that happen? It doesn’t always happen. The 2004 Boxing Day tsunami saw the sea recede along the coast of Thailand before the wave, but not when it reached India and Sri Lanka, when a huge hill of water just arrived without warning. I’m also still not sure that the Storr Eggar event caused the coastal inundation of the UK as I prefer the theory that the ice walls lifted, off the coast of Nova Scotia, releasing the waters that had covered Canada which might be correlated with the same time zone. Channels on the seabed support this theory. The water level across Doggerland had been rising by the day for some time before the inundation, up until the final surge which drowned the land which was where the North Sea now separates UK from Europe. Civilizations inland in North America also lost their water around that time and a long drought set in. The drowned forests off the west coast of Wales still give up their antlers from time to time suggesting that the broken trees kept the animals in place. Off the coast of South America however Darwin observed that dinosaur bones were heaped up in massive jumbles along the shore suggesting a huge wave deposited them there. Just speculating here. Storm surge usually arrives with the incoming tide. It’s a peculiarity of the Severn that the tide, particularly in winter, seems to arrive at the village of Arlingham within an hour of sunrise…the time seems to fit. Reports of the water receding I’ll take with a pinch of salt because the Severn estuary at low tide.. Damn ! There is not that much water to do any receding in the first place, and what there is, is river, with a typical depth of less than 2m all the way from The Noose (the first bend in the river as you move inland)to near Avonmouth. As for the clear weather conditions, I would say the greatest PRACTICAL expert on the behaviour of the river and the tide is Steve King… world record holding long distance surfer (on the Severn Bore), an engineer professionally, and from a family who have worked the tides and the river for centuries. He has often been asked about the impact of swell that hit our coastline on the Severn Bore, and his answer is always very specific…and borne out by my personal experience. The Severn Estuary has a very small swell window. He says that for any significant effect to add water to the tidal bore we need to have a deep storm system rotating about 100 miles due south of Cork, with a pressure of around 970 mb or less. I by no means write off any chance of a tsunami being the cause, but for me, the odds are stacked against it. My feeling is that the evidence favours a weather event. It happened exactly at peak spring tide. There was a very strong wind, and there was some flooding on the east coast as well. For a tsunami, one might expect a felt earthquake and report from other areas around the south and west coast. I had not seen any reports that the water at first went out. The case is still open. But to me, the balance of probability is weather related. Weather effect on tides can be a trap. We dry out our lift-keel boat in tidal lagoons, know that tide heights are just estimates, check carefully and allow a safety margin. Getting caught could mean you’re stuck for weeks unless you start digging yourself out frantically as soon as you tweak to what’s probably going to happen – but you’re still guessing (“uh-oh – high tide is in 30 minutes – and we’re not floating”). Almost caught once like that, predicted high tide was down about 300-450mm on what it “should” have been based on the tide the day before which was probably raised by an offshore low-pressure system. “De-tided” tsunami gauge charts show the variation between forecast heights and actual quite graphically. Well, this one nicely completes the stack on M2+ on the NE side. 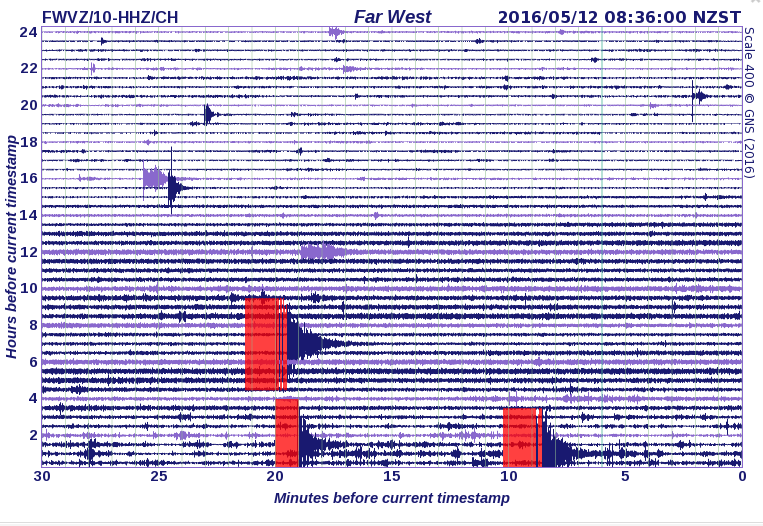 last week (May 6) we had a similar stack of similar strength earthquakes on the SSE side. Nice symmetry. The other day you mentioned the GPS signals are going up and down in what seems like a cyclical pattern over a few days. This shows up on most of the GPS plots around BB. Bárdarbunga gives us a new star to follow up on yesterday’s swarm. M3.6 at 4.1km depth. There’s been quite a bit of coverage of Bárðarbunga in the Icelandic media over the last few days, and it’s contained some interesting comments from geophysicists that have increased my understanding of the activity that we’ve been seeing over the last 6 months or so. In lieau of the resent activity there will be a post later in the evening about the current behaviour of Bárdarbunga. I recently said I would not write about Iceland for a while, that surely bit me in the posterior. Great – many thanks. I’ll look forward to that. One question I had about VEIs is how they relate to jökulhlaups. I mean, would a VEI 2 on the NW edge of the caldera be substantial enough to put Sigalda HEP station out of action? And, vice versa, if Dettifoss was caused by a ‘hlaup, what kind of VEI would have been involved. We know very little about Jökulhlaups out of the caldera itself. The known Jökulhlaups have all originated out of the Loki-cauldrons that may be a separate volcanic feature. But, in general. Jökulhlaups correspond badly to VEI-size. You could have a VEI-0 eruption that generates a lot of heat over time but never breaches the ice and still generate a substantial hlaup. And you can have an eruption like the boarderline VEI-5 of Grimsvötn that produced 0.7 to 0.9 cubic kilometer tephra and what is believed to be 1 cubic kilometer of sub-glacially emplaced lava that generated a medium sized hlaup, far smaller than the smaller Gjálp eruption of 1996 caused. In my opinion a caldera-eruption would not generate a large hlaup since most if not all water would be contained by the caldera walls. The enclosed nature of Bardarbunga’s caldera is interesting to me. I’ve wondered how that would or wouldn’t affect a potential eruption of any given size here. I remember a map of the altitude of the rockbase beneath the glacier, discussed at the time of the Holuhraun event. I couldn’t find it, but stumbled over a pdf where that same map was used. There is a low passage in the eastern part of the rim (about 1300 meters high), not more (maybe less, condering the method of surveying) then 100- 150 meters above the caldera floor. An erosion ‘lane’ is not strange, because of the ongoing iceflow in the eastern direction. Thank You, “Island” my favorite subject. Interesting quake – a 26km deep quake directly beneath Trölladyngja, which was entirely silent during the prev Bardarbunga episode. I noticed a small quake there earlier this week as well. Nothing huge, but it’s interesting to see some activity there, especially with how deep this 26km quake is. It was having a serious bout of those deep ‘uns prior to the Holuhraun hubbub. An article trying to interpret the latest activity at Bárdarbunga!